Welcome to the Lands of Mythron! This is a medieval role playing game where members use LEGO creations to tell the adventures of their character and the story of the Lands of Mythron (LOM). You can battle enemies, plant spies, rule towns and attack cities. For every creation you post you can earn points that will advance your rank. Come join the largest LEGO fantasy role-playing game on MOCpages! 1. Click here; to visit the Signing up Thread. Choose your faction and comment with your choice. Take your time with this decision as it is a very important one. 2. Build your character intro - a moc showing your character and your faction. Click here for more information. 3. Participate in the group by entering challenges and/or posting free builds related to the world to earn points. In the days of old, before the Battle of Unbinding, before the war with Rainos, there was one kingdom: Mythron. Those were prosperous days. But like any other peaceful age, it was not to last. Evil seeped into Mythron through numerous forms - greed and madness in a ruling class that became alienated from its people, particularly in the High King. The successor to that corrupt ruler nobly attempted to bring together the Lands of Mythron once more. But, try as he might, the one man could not save the kingdom. Sick of bowing to the foreign kings of Mythron, the people of Rainos overthrew their government and started a war of independence. In the chaos that followed, the king was killed and the land split into five factions: Mythron, Rainos, Enalica, Nerogue, and the Outlaws. 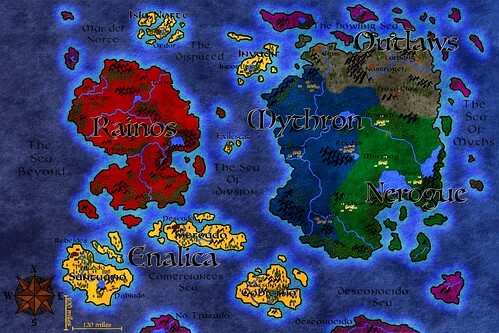 Mythron is the most developed country on the map, and it has been home to kings and emperors for many years. People in Mythron have watched as an empire that once united the entire map weakened and shattered under the rule of unprepared kings, and now they are the people who look to the future with hope for a unified, peaceful world once more. Currently, the faction is full of heroic knights and noble adventurers who live in a prosperous kingdom ruled by a descendant of the line that once reigned over all the Lands. Their official flag is black and blue. Rainos is the untamed island in the west. Although it has a king, the king's role is more to act as a mediator between Rainos' many local cultures than to impose strict rules on them. The country is made up of hundreds of clans, tribes, towns, cities and fiefdoms, and these communities tend to make their own laws and decisions. Rainos is an excellent faction for those who value freedom over order and wish to find their own paths in the world without bowing to the needs of an overarching government. Their official flag is black and red. 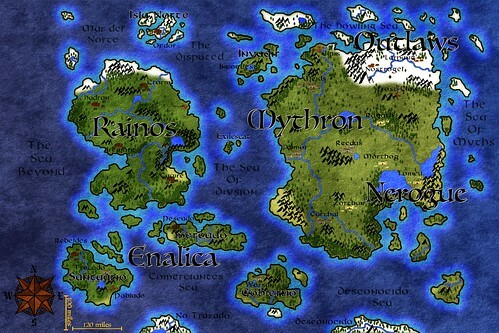 Enalica, the wealthiest of the nations, holds its Golden Empire in the scattered islands between the two rivals of Rainos and Mythron. Known for its trade, naval power, and industrial growth, its citizens enjoy a Golden Age of prosperity and progress, where anyone can settle to make their fortunes with new advances in weaponry or domestic life. Ruled by a military general and driven by innovation and change, they are striving for a better future. This is the new age. This is the Golden Empire. Their official flag is black and gold (or yellow), but Enalicans are known to dress very colorfully. Order was made out of chaos - that is how the Mythron-friendly faction of Nerogue was founded when it rose from the sacking of Tomeu, and that is what (along with justice) the members of the order devote themselves to. Many Nerogueians are reformed outlaws, but they devote themselves all with a single-mind to the task of restoring peace and order to the world. This army's uniforms are dark green, and its formal colors are dark green, dark red, and black. Outlaws want power, freedom, and fame. They are people who wish to decide their own fate, make their own rules, and live life however they choose. The faction is a confederation, and each Outlaw has chosen to be a member for the strength and protection that the network offers. No colors are assigned to the outlaws. Copy the html code below for your faction's banner to put on your homepage!